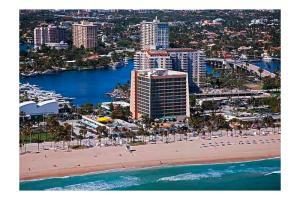 This Ft. Lauderdale hotel is nestled between the Atlantic Ocean and the Intracoastal Waterway. Take in a sunrise on the 23 mile stretch of golden beaches. Stroll along the beach promenade and explore the abundance of boutiques, restaurants and nightlife. Take a moment to soak in the sun or sip your favorite beverage at the Pool Bar. Enjoy spacious accommodations with breathtaking water views.